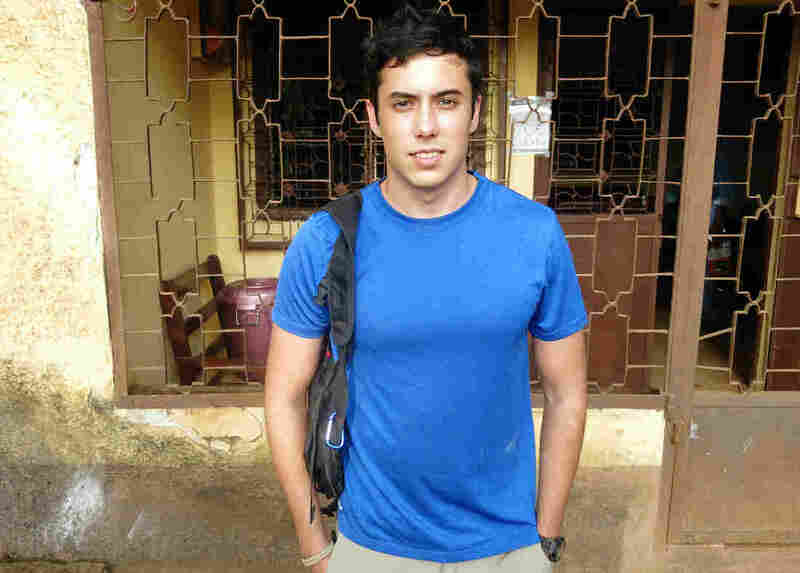 American Millennial Missionary In Guinea Isn't Scared Off By Ebola : Goats and Soda Luke Whitworth, 23, came to Guinea from South Carolina 13 months ago. That's when the outbreak there began. His sponsoring group gave him the option to leave — but he's determined to stay. Luke Whitworth came to Guinea in December of 2013. His Christian faith had deepened throughout college, and he was eager to begin work as a Baptist missionary. Around the same time, Ebola arrived. "At the very beginning, I'd never heard of it," he recalls. The virus was spreading through Guinea's forest region. Whitworth was here for a two-year stay. He started researching Ebola. "Just seeing the death rate and what it does to your body, it was scary," he says. But he's still here — and he hasn't been back home to his native South Carolina. The 23-year-old sits down with us in the Baptist mission's open-air lobby. He's clean-shaven, with dark, wavy hair pushed to one side — wearing a T-shirt and shorts, socks with open-toed sandals. He has a disarming smile. He's a "journeyman" for the International Mission Board — a commitment of two-to-three years. The group was founded in 1845 at the first Southern Baptist Convention; its goal is to "bring the Gospel of Jesus Christ to the lost peoples of the world." Whitworth and the other Baptists teach English three days a week in Forecariah, two hours east of the capital, Conakry. He also goes out and talks to people about his faith. There are a lot of challenges. The locals speak Soussou. The official language of Guinea, a former French colony, is French. Luke Whitworth, from Pickens, South Carolina, speaks neither of those languages. And he signed up to spread the gospel of Christ in a predominately Muslim country. Then came Ebola. When the virus was identified, the IMB gave Whitworth the option of packing his bags. He never really considered it. "The Lord has given me the strength to do what he's called me to do, and we've actually had more doors opened to us through this," he says. The Baptists began educating villagers about how to protect themselves against Ebola. Those messages don't always get a warm welcome because of suspicion toward strangers. Ebola is a frightening disease, he says. His parents and twin brother and friends back home worry about him. But they've been supportive all the way. He says the arrival of Ebola in the U.S. helped friends and family understand better what was going on in Guinea. "Because it made the situation more real to them, so it shined light onto what I was having to deal with and what the people were having to deal with here," he says. Which of course, didn't make them worry any less. But whatever happens, Luke Whitworth believes it's part of a plan. "I do enjoy it a lot," he says. "It is definitely challenging, but this is where the Lord has me and I'm happy here."